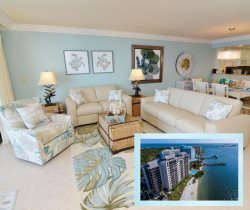 We offer spacious 2 bedroom - 2 bathroom waterfront condos in Punta Rassa, Fort Myers, FL. The condo balconies overlook Sanibel Island and many barrier islands. The Punta Rassa community amenities include a heated swimming pool, whirlpool, tennis courts, shuffleboard, outside grills, fishing pier, and children play area. Sharing the same property is the Sanibel Yacht Club which offers a restaurant & bar. Only a short walk away is the Sanibel Harbour Marriott Resort & Spa which offers six distinctive restaurants and lounges to choose from and a Spa and Salon for Health, Relaxation, and Rejuvenation. The Punta Rassa vacation rental condo community is the last exit, Punta Rassa Rd, off of Summerlin Road before going over the causeway to Sanibel Island. Upon exiting Summerlin Rd proceed straight that will take you directly to the entrance of the community.